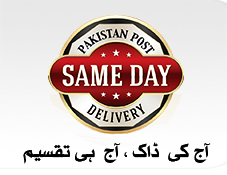 Pakistan Post in pursuit of its policy of providing efficient and economical services and to meet the present day requirement of postal clientele especially commerce and industry, has taken many new strides during recent past by launching a variety of new special Mail and Financial services which are running in competition with private courier services. The hallmarks of these premier postal services are cheaper rates, high, efficiency, widest network etc. Pakistan Post having country wide network where others simply cannot reach provides efficient, cost effective, secures products & Services to the people & organizations. Please click here to download Customer Registration Form. Delivery of statements of accounts/other sensitive documents, packages/parcels. Urgent Mail Service, Registered Post. Letter Mail Services etc. For Urgent Mail Service, avail special discounted rates & pick up facility. For delivery of bulk mail through ordinary post, special package with negotiable tariff. Bulk mailers desirous to avail the special concession for transmission of Urgent Mail Service and Registered Mail will register their firm’s /organization with Pakistan Post. They will be registered with the Post and will continue to avail this facility as long as they dispatch mail in bulk. Registered Post which is a recorded and trustworthy delivery service is available for the entire country. Urgent Mail Service (UMS) a fast and reliable delivery network covers 214 destination of the country. Pay your Electricity, Telephone and Gas Bills till late night at any of your nearest General Post Office or Post Office. The bulk customers having monthly billing of Rs. 7,000 or above can avail monthly Pick up and Credit Facility. All bulk customers including commercial organizations, institutions, and multinational companies can avail pick up and credit facility by filling up a registration form. The nearest G.P.O / Express Post Centre will provide all necessary details and fully help in completion of all formalities for registration. After registration, express Post Pick Up couriers will daily visit offices of registered customers daily according to a pre-arranged schedule. Emergency on Call Pick up Facility is also available for registered customers. Billing on monthly basis for making payment within 7 days of receipt of bill. Payment of postage charges through franking machines is also permissible. Note: Above UMS tariff is subject to levy of GST @ 17%. I/We wish to utilize the services of Pakistan Post as per details in item 3 above and agree to settle invoices raised monthly in accordance with tariff as prescribed from time to time against my/our account by making advance payment at the time of booking. All Rules and regulations prescribed by Pakistan Post will be applicable in this context.